When the White House announced it would impose a 10% tariff on all steel imports from China earlier this year, Wall Street feared it would hurt the manufacturing sector's bottom line. With quarter two earnings rolling out, it looks like Wall Street's worst fears are coming true. Some of the nation's largest industrial companies have tightened their belts in the face of rising material costs, punishing their bottom lines – and their shareholders. We've found a stock that's steering clear of Washington's red tape and making a killing in the process. It's a steel stock reaping serious returns from the shifting international trade landscape. And it's trading at a ridiculously low price. This steel company has already jumped 25% over the last month – and it's expected to jump more than 300% in the next year…. American manufacturing giant Whirlpool Corp (NYSE: WHR) was expected to directly benefit from the administration's 20% tariff on washing machine imports. However, rather than give Whirlpool a boost, tariffs have forced the company to cut guidance as it expects to shell out an additional $350 million for raw materials in 2018. According to CEO Marc Bitzer, the company is now subject to a "significant decline in U.S. industry demand" as a direct result of America's tariff policy. And Whirlpool's predicament is anything but a standalone case. The iconic motorcycle brand Harley-Davidson Inc. (NYSE: HOG) is expected to lose between $45 million to $55 million due to tariffs. Company CFO John Olin stated that U.S. tariff policy will increase the company's expenditure on raw materials by roughly $20 million. And additional tariffs from the European Union, imposed as a retaliatory measure against the White House's trade policy, are expected to cost Harley roughly $35 million. All of this led the Milwaukee-based company to lower its 2018 operating margin guidance from 10.5% to 9%, a move that will translate into smaller returns for shareholders. On July 28, GM posted earnings that showed a $300 million jump in the company's commodities cost from just a year ago. The rise, due in large part to the White House's 10% tariff on steel imports, forced the nation's largest car manufacturer to lower its guidance for 2018. According to CFO Chuck Stevens, GM expects a $1 billion net headwind from the long-term fallout from tariffs. The news sent GM's stock down 7.3%, burning shareholders and crushing short-term returns. And this economic fallout may not be limited to the manufacturing sector. 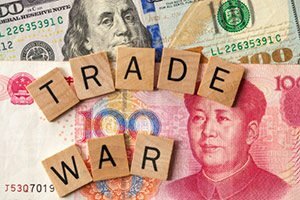 According to international credit rating agency Fitch Ratings, the escalation of global trade tensions could cut global economic growth by 0.4% in 2019, with the United States, Mexico, and Canada bearing the brunt of the slowdown. According to the agency's report, a majority of this negative fallout will be the result of the United States "imposing tariffs on a large proportion of its imports while being hit simultaneously by retaliatory measures from four countries or trading blocs." With clear signs that the White House doesn't plan to back off anytime soon, American firms across industries are likely to see their bottom lines shrink as the impact of tariffs work their way through the economy. That's why our favorite steel stock to buy steers clear of the White House's red tape and sticks to profits.